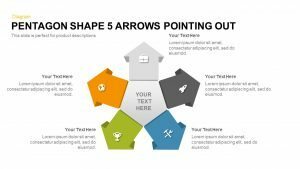 The arrow infographic template for PowerPoint and keynote is flat vector design that will consume any topic for the presentation. The peculiar arrow designed with a circle instead for a dart point. 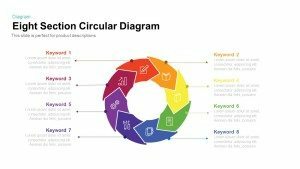 The layout is suitable for business presentation as well as educational presentations. Business development, business process, business strategies, plans, stages, steps can be taken as a presentation topic. 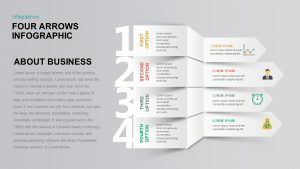 Apart from these, business agenda, company vision and mission, core values, startup ideas can be also illustrated with the colorful business template. 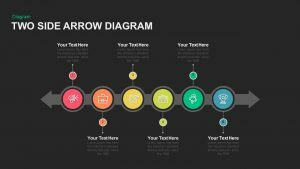 The arrow PowerPoint template colored attractively and has three topic zones on the surface of the each ribbon shape arrow design. 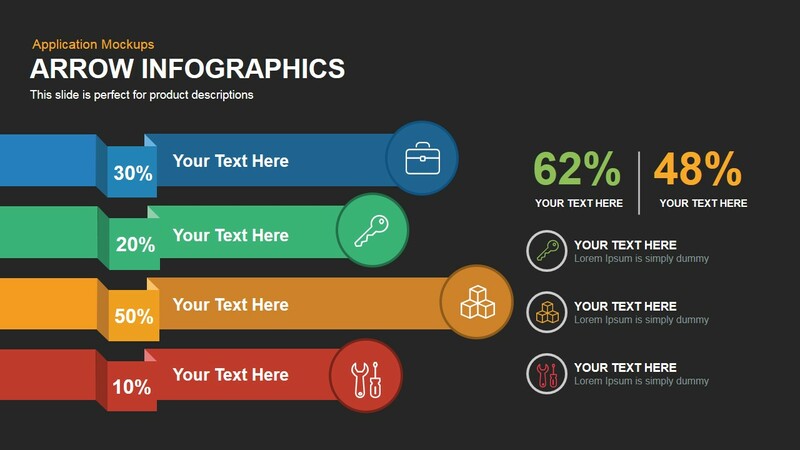 User can use the icon placeholders, flat text placeholders and folded zone that indicates the percentage placeholders to show the different elements of the same concept. Besides, there is a text zone for the detailed descriptions. 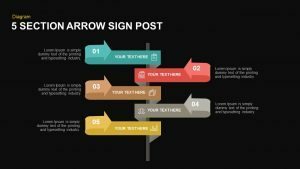 This abundance for the texts is the major highlight of this infographic arrow powerpoint template. 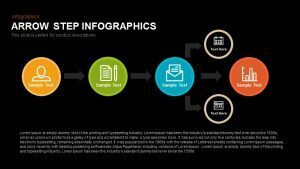 Sales report and marketing risks can be projected by the sales managers or marketing managers. The arrows are designed in an unequal manner. The height of the horizontal arrows shows the differences in the sales volume and market possession. 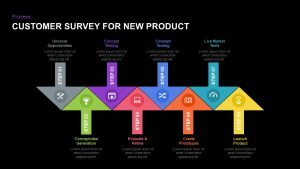 User can use it as a comparison PowerPoint diagram, and make comparison between two or four products. 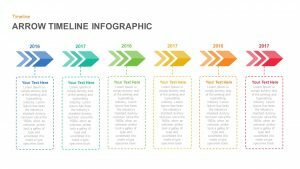 The arrow infographic template for PowerPoint and keynote helps the presenters in displaying easy to understand project flows and events. The customization features of PowerPoint enable users to make alterations in design to meet their needs. 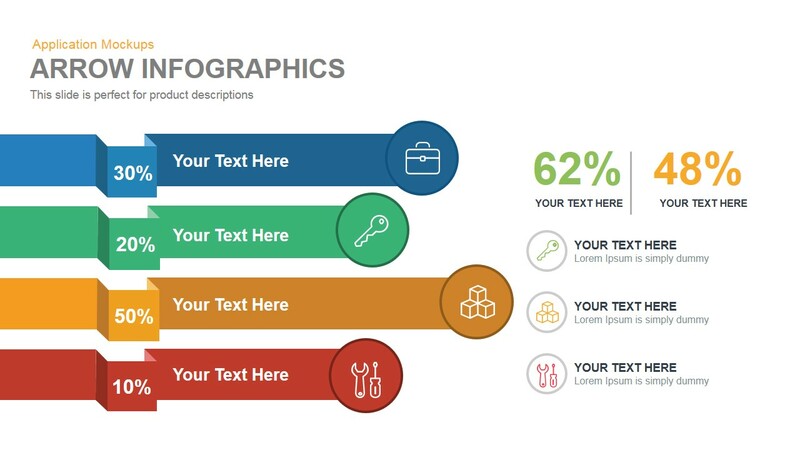 Edit text placeholders, change color and effects without requiring expertise in PowerPoint presentation. 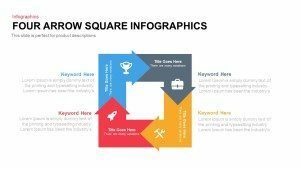 The PowerPoint clipart; briefcase, key, steps and tools can be used for the support pillars of the presentation subject or insert new objects, which have excellent sync with the subject matter. 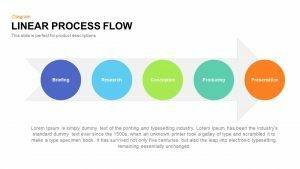 User can search and download arrow process diagrams and rock the presentation. 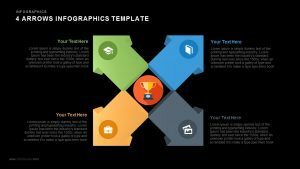 The template slide is worked in both PowerPoint and keynote. 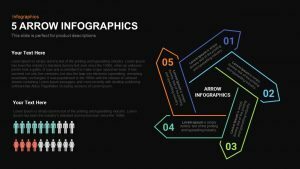 Infographic arrow powerpoint template and Keynote use the template and rock your presentation The template is designed in both PowerPoint and keynote version in 16:9(widescreen) and 4:3(Normal) Version.